Christmas is finally started at my house. Ok, nothing big like the tree or anything, but I did get one vignette done on the dining table. That counts doesn't it? People often ask me how I put a vignette together, so I thought I would explain how this one came about. Since I have gold and silver in my LR/DR I thought a mix of both would be in order. 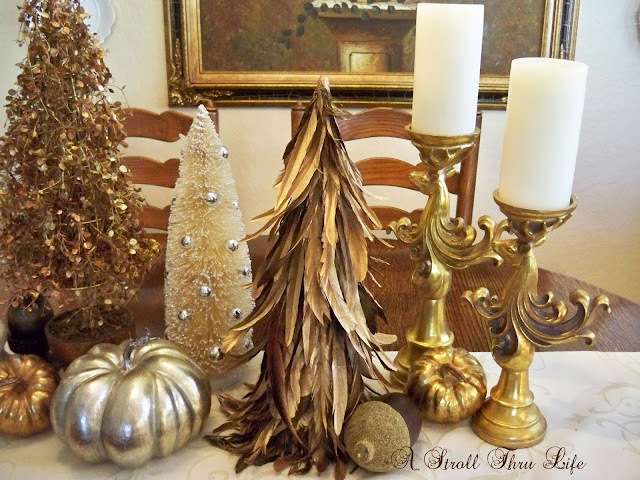 I found the gold tinsel tree at Goodwill last year and the gold feather one from Tuesday Morning clearance last year. So I added the white and silver bottle brush one from Home Goods this year and made them the main focal point of my display. I added a gold and silver pumpkin at the base to help ground the trees. 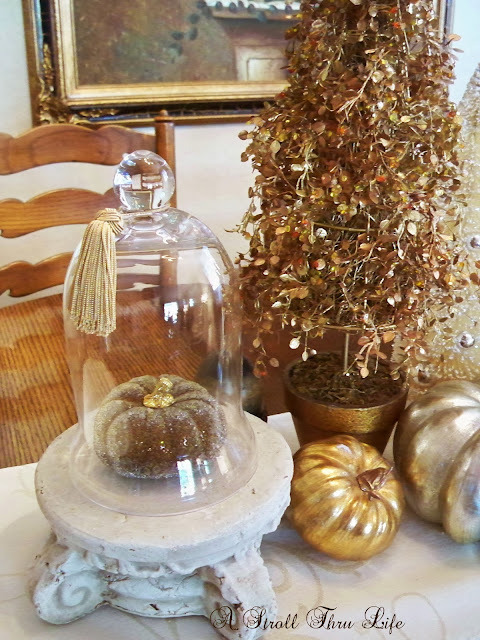 I was already using the gold beaded pumpkin under this cloche, so I just added it to this side for balance and to help vary the height. 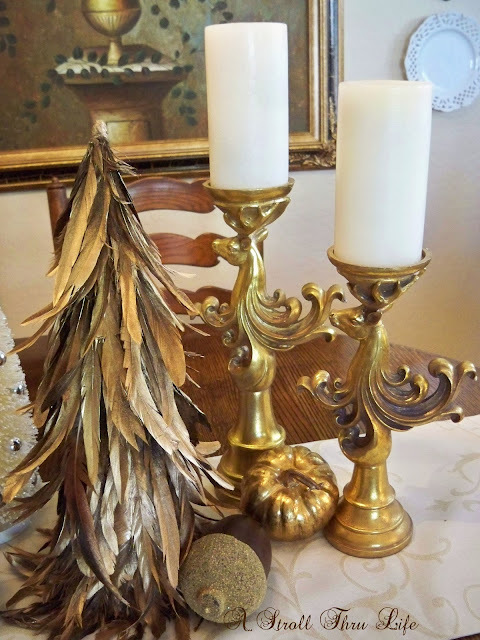 This side got my two reindeer candlesticks I got on clearance at Tuesday Morning last year when I found the gold feather tree. An acorn and another gold pumpkin to help ground this side of the display. That's it, just gather a bunch of things that you want to use, vary the height and add contrast (in my case gold and silver) for interest and you have a winner. Don't forget to enter my $150 Black Friday Giveaway. Enter now, winner will be announced on 12/3. Marty, Your vignette is so pretty! I love your trees. I saw vintage bottle brushes yesterday at Queen of Hearts Antiques. I've been kicking myself for not buying some. They were quite expensive though. Hope you had a fabulous Thanksgiving! I like using silver and gold together too Marty. I have to get the wreaths up today...and that might just about cover it for Day One of decorating for the holidays! You're off to a great start, Marty! I got quite a bit done Friday, but then my back gave out. I've been laid up on the couch with a heating pad but hopefully can get back to tweaking tomorrow. I love the gold and silver together Marty! 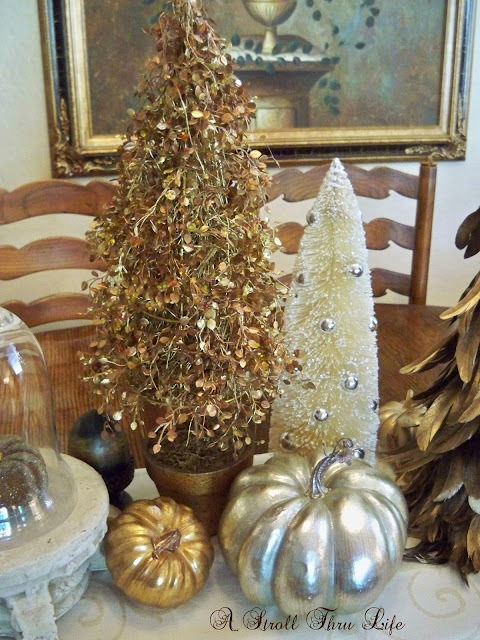 I tend to decorate the same way - one vignette at a time! At least we still have the whole month for the rest! Enjoy your Sunday! 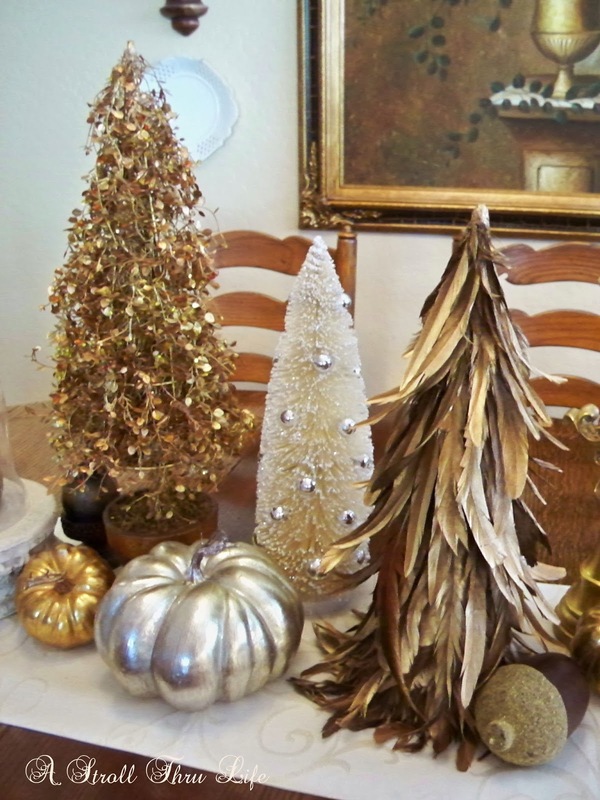 Your variety of trees makes for a great centerpiece. Hope you had a wonderful Thanksgiving! Marty it really is beautiful. Thanks for sharing your thoughts. Decorating is not my strong suit but I have found I am teachable. Keep it coming! Beautiful vignette, and definitely it counts for starting the Christmas decorating! I really like all the different textures of little trees! You are off to a great start! I love your reindeer candle holders. Beautiful Marty...I love that feather tree! You are on the ball Marty and I love that you're still using pumpkins. I was also planning to do metallic and white this year. I'm planning to also add copper to the gold and silver. Found the perfect coordinating wrapping paper at Costco. Yes, Marty it counts!! The Christmas Season is officially open and you started it off beautifully with your mixed metal vignette!! Marty your vignette is beautiful! Marty you are the Queen of Vignettes, no one other like you! 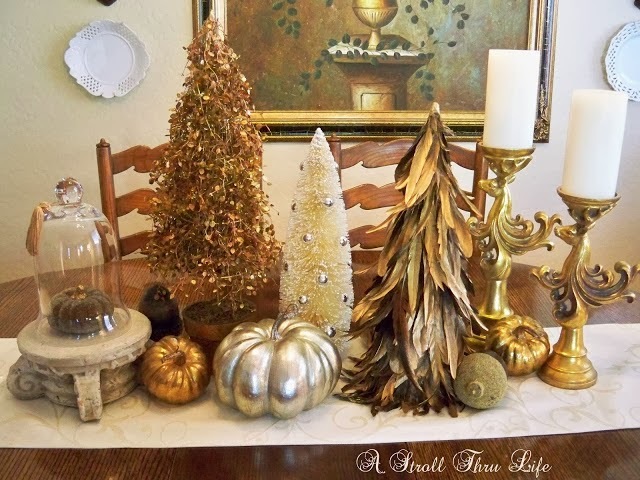 Your table vignette is stunning, I love all the golds with dash of silver, gorgeous! The feather tree is SWOONnnnnnn!!!!!!!!! Thank you for the tutorial, it's gonna help me. Thank you for your sweet visit, it made my day! Lovin' your Christmas Tree vignette, dear friend!!! I agree that the Traditional Silver and Gold are unbeatable for Christmas decorating!!! Much like you, I'm doing one vignette at a time!!! I'll be back to visit, soon!!! Your vignette is so pretty. I love the gold and silver together. Very beautiful. Keeping with a monotone color scheme is so striking! You've done it beautifully with the golds in so many textures...looks great Marty! As always...a beautiful vignette Marty!! I love your little trees! Decorating is happening slowly here finally as well...Enjoy your day! Love the mix of these two anytime and I love how you mixed the different types of trees in as well!!! Yey, Christmas is here soon and I can't wait too see more of your lovely Christmas decor Marty! I love your trees, isn't it great how we can find things at Good Will? Love the mix of gold and silver. 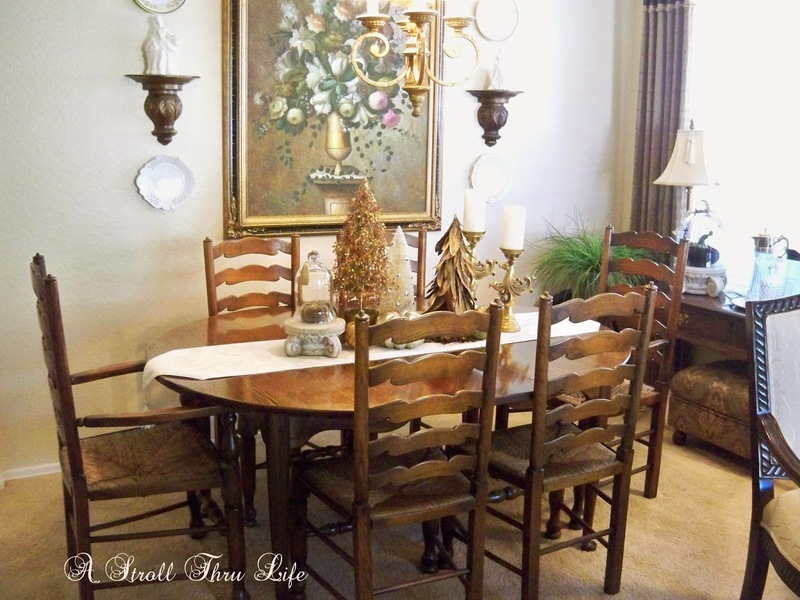 Your vignettes always look great Martt! HI Marty! This is so pretty! I used to say you were the Queen of cloching but now you're also the Queen of vignettes. Hope you had a wonderful Thanksgiving. Beautiful Marty! Love the silver and gold combination! One vignette is a good start, especially when it looks like this!! Hi Marty..your vignettes are always gorgeous..and this one is no different. For me it's the tiny touches you add..the tassel on the cloche etc. Your colors always go together so well.. Wonderful to have you Seasonal Sundays. Love all the vignettes with gold and silver color. I am a fan of anything gold. They look pretty grouping together. And oh, I love your new header. I have not been visiting a while and I see the changes. Love it! Love your house! Did I see in an earlier post something about packets of Russian tea? I thought I saw a basket setting by the entry? Link?